When I moved to my second New York apartment, I was dating a college guy. I’d been pretty proud of my home decor skills, but I remember visiting his on-campus apartment and noticing the bar cart he’d placed in a corner. It was cute, sophisticated and interesting — and it made me a little jealous. How had I, a bona fide adult, neglected to fill my home with this obviously mature thing when my college-age boyfriend hadn’t? This was a wrong that needed to be righted immediately. 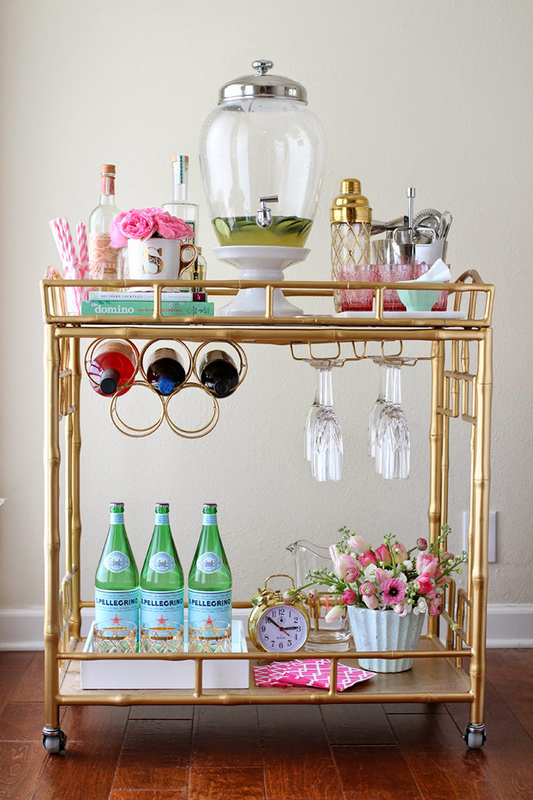 I set to work to find and buy a bar cart for myself at once. But I quickly realized that was only half the battle — figuring out how to decorate it was a challenge unto itself. For starters, what do you put on it — liquor and wine? That’s an obvious place to begin, but I usually only have a few bottles at a time. The buy-drink-restock cycle doesn’t lend itself well to filling a shelf (or several). OK, maybe glassware, then. But that raises the question of how to organize it. 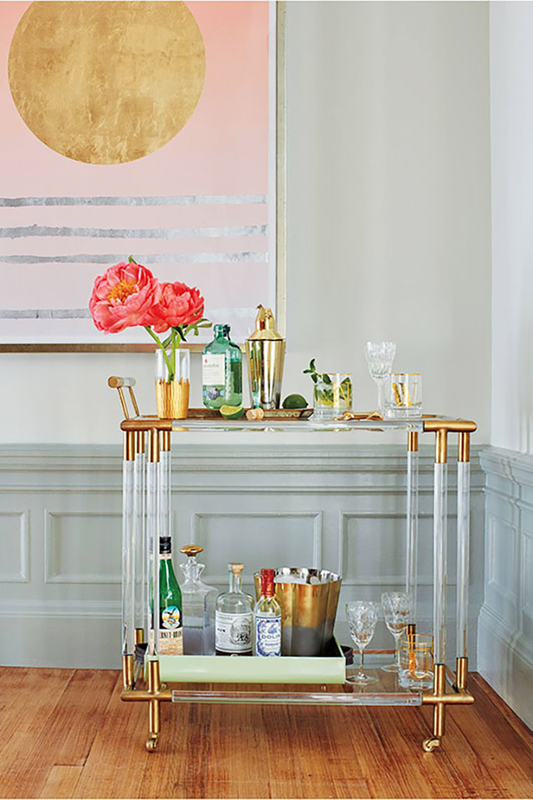 A circular bar cart fit into my space better than a rectangular one did, so I was denied the opportunity to arrange things in lines. Instead, I had to get creative — arcs, semicircles and clusters became key. But trust me when I say it takes a lot longer to put things in cute, appropriately sized clusters than it does to arrange them in straight lines. Then, of course, there’s the question of color. 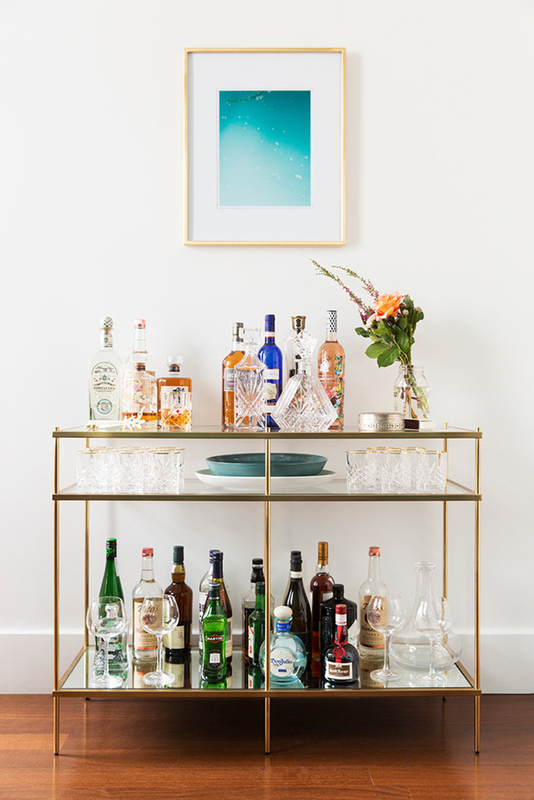 All glass and a little liquor make for a pretty dull corner — especially if your bar cart is made from metal, glass or some other neutral. I ended up adding candles, iridescent bar accessories and some colorful glasses in an attempt to make something interesting happen. 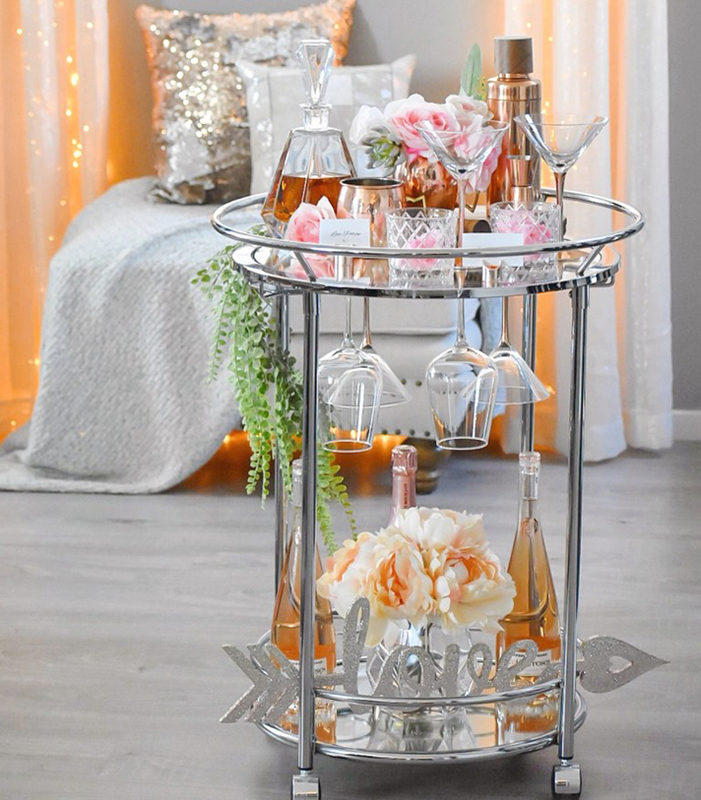 To save you the heartache I didn’t save myself, I’ve perused Pinterest and pulled 29 of the most stunning bar carts I’ve ever seen. 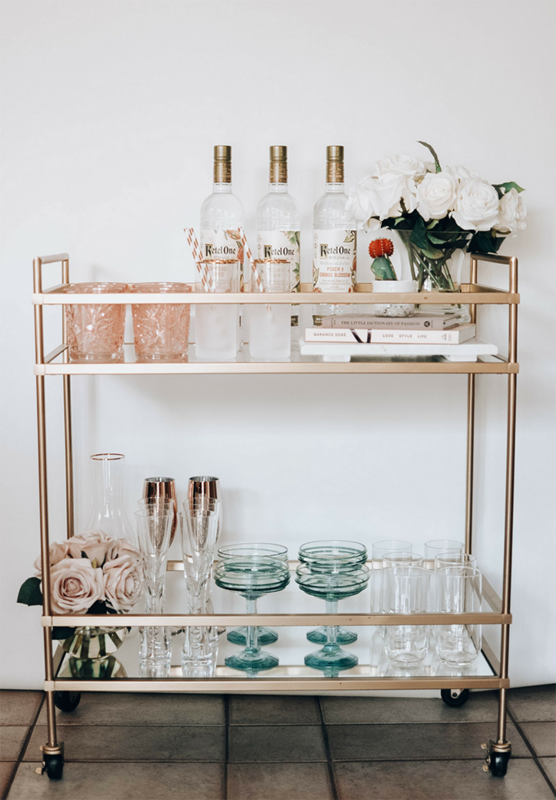 Consider browsing this list before buying a bar cart — it might lead you to preferences you didn’t know you had regarding things like shape, color and additional features. 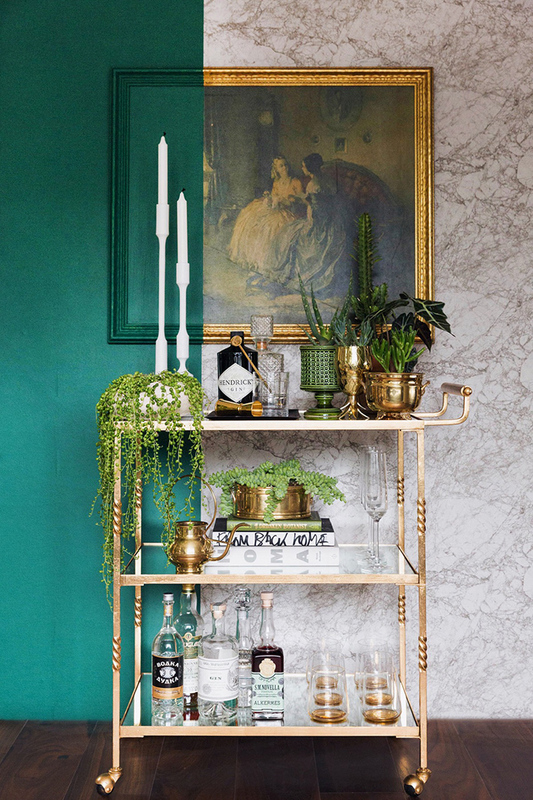 Who said greenery, books and candles had no place on bar carts? 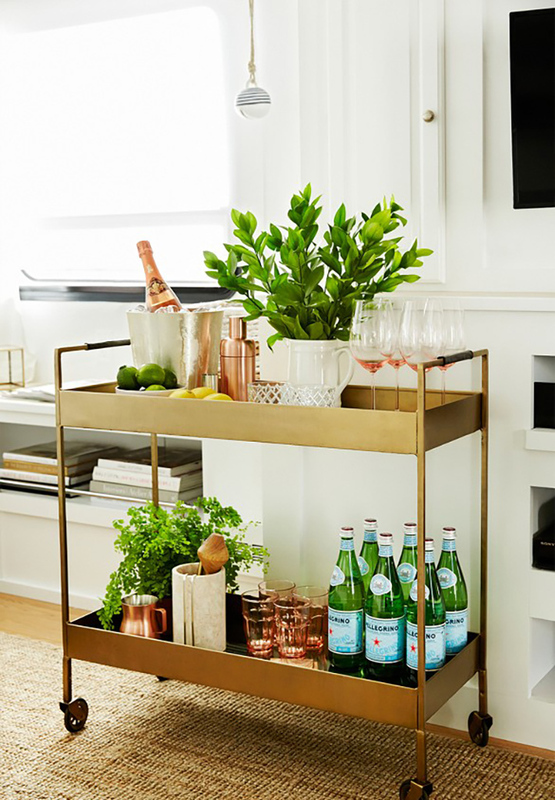 See more of the bar cart here. 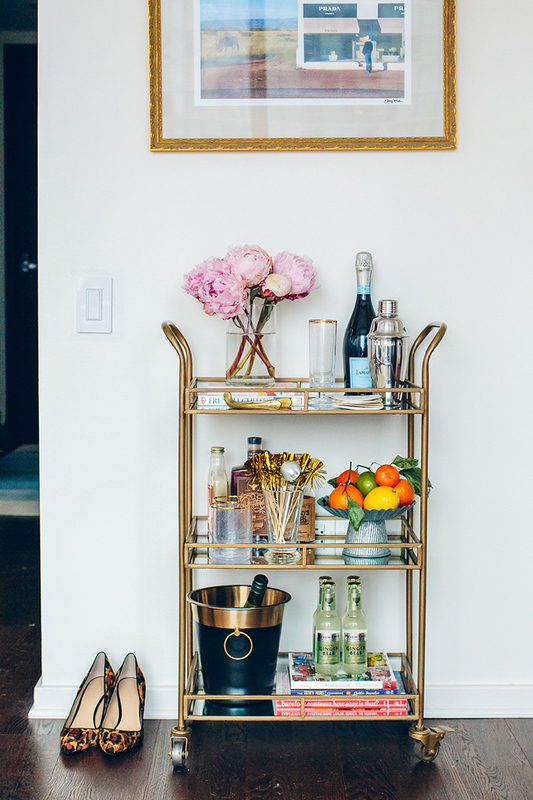 Wine glasses, Pellegrino, fruit-infused water and more. Basically, a party on wheels. 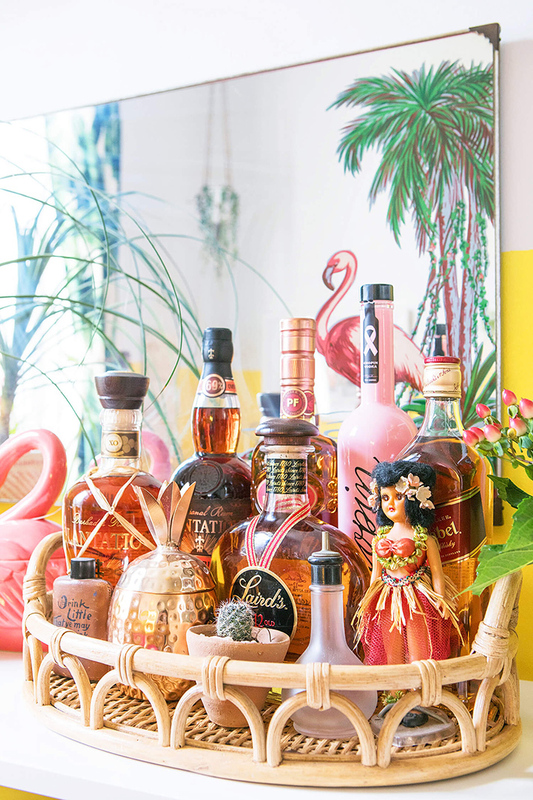 Your favorite bouquet would look great next to your favorite liquor — don't ya think? See more of the apartment here. 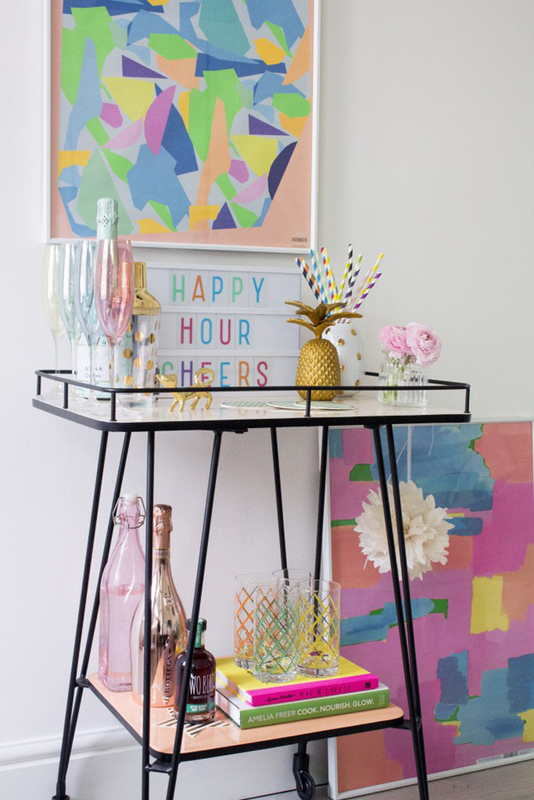 All the more reason to stock up on cute glassware (and even cuter straws). 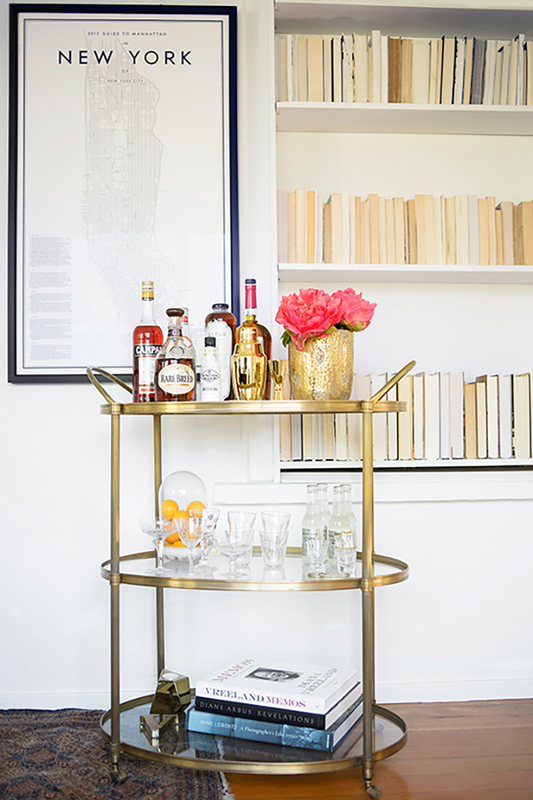 In lieu of a cart, a portable bar tray will certainly get the job done. 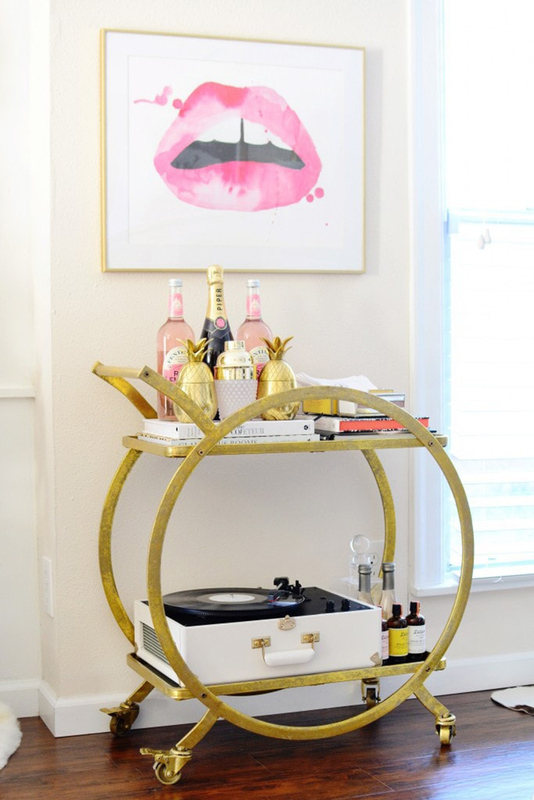 Because filling up two whole shelves with alcohol can be tough, and sometimes, it makes sense to sub in a record player instead. 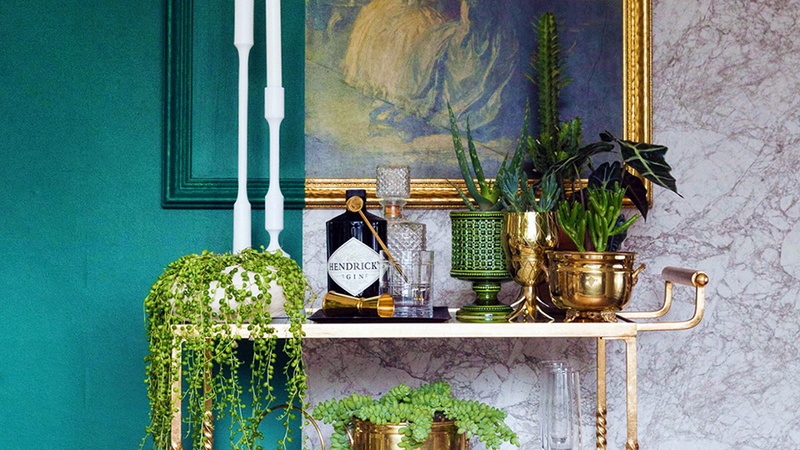 Your favorite plants will match your lime garnishes perfectly. Excellent for corners that feel a little bare but don't offer much in the way of decor space. 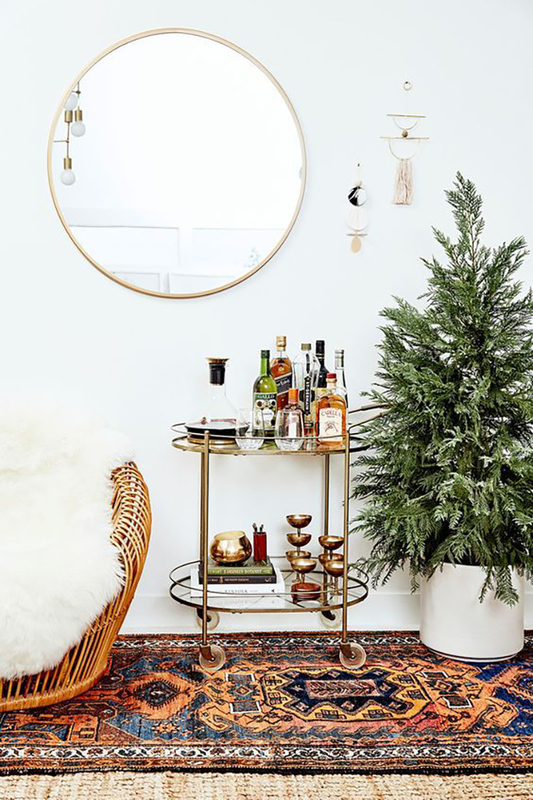 Coordinate your bar cart with other home accessories, like the huge statement mirror in your living room. That pineapple canister you weren't sure what to do with will be the cherry (mmm, pineapple?) 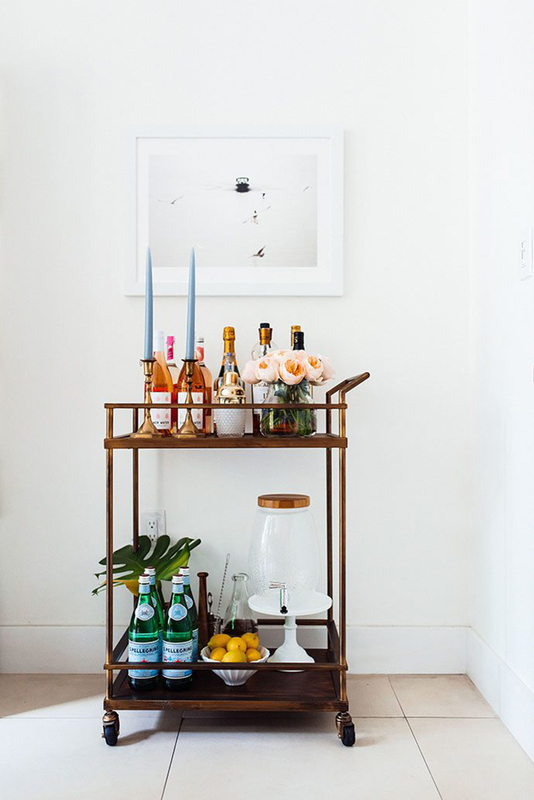 on top of an already cute bar cart display. 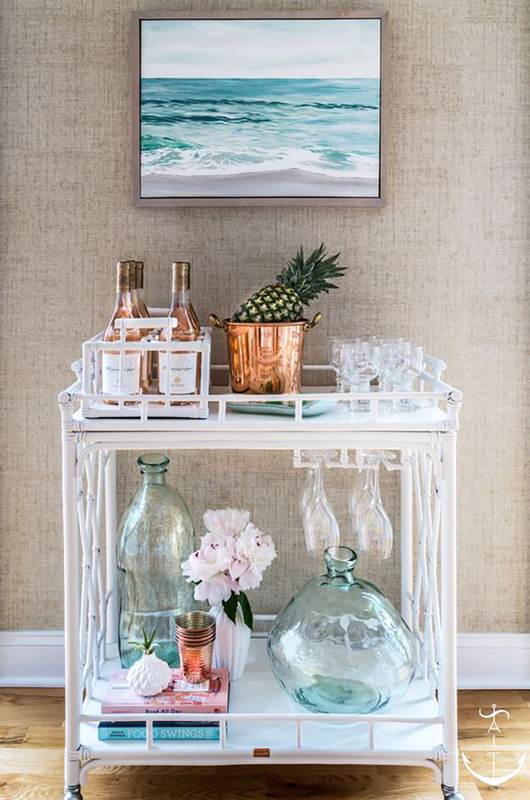 Level up by placing your bar cart in front of a similarly themed painting. Not sure why you'd own a bust. 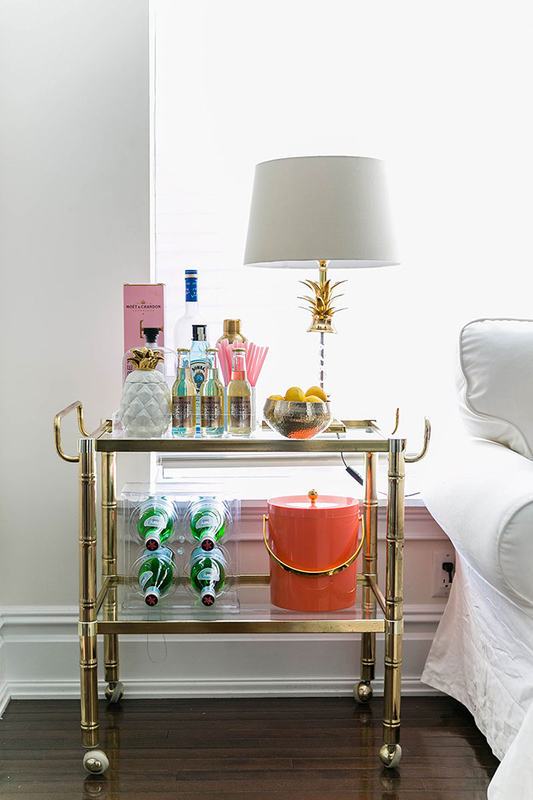 But if you do, it'll take your bar cart from cute to memorably unique. 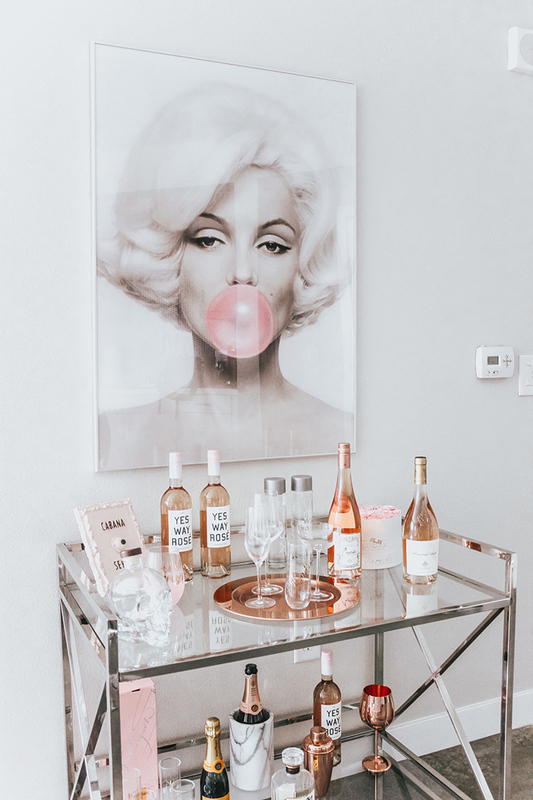 Worried your favorite wine doesn't fit your carefully curated home palette? 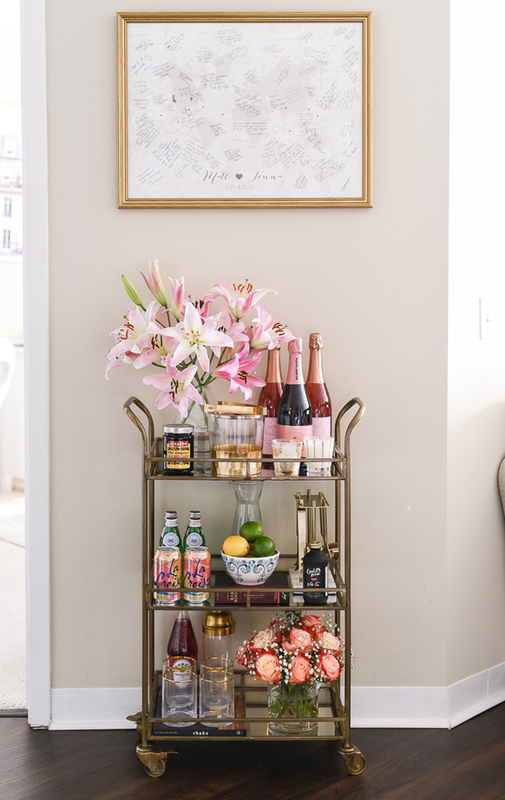 Use your bar cart as an opportunity to infuse your space with a pop (or a few pops) of new color. 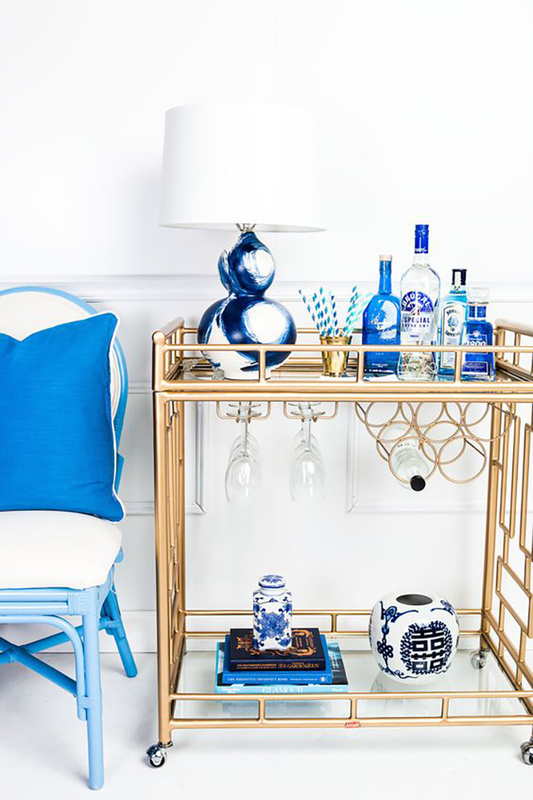 Pro tip: When it comes to woven bar carts and trays, the beachier you go, the better. 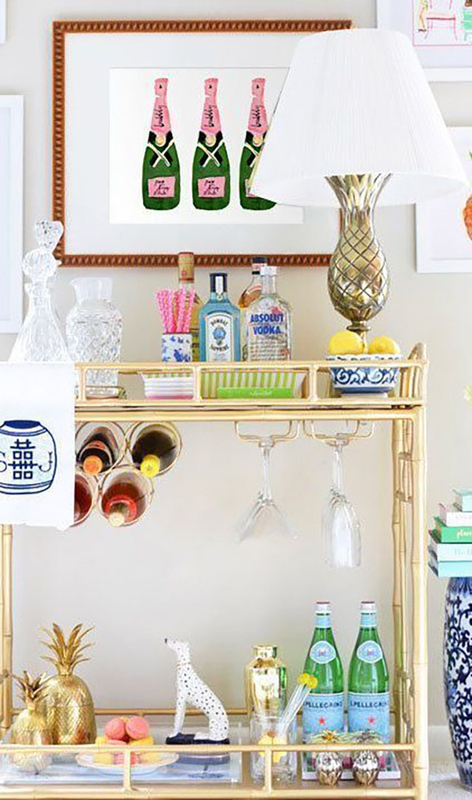 Hanging a cute teal towel off the side of your bar cart will make you look impressively prescient in the case of an inevitable spill. If your liquor comes in bottles of the same color, commit to an achromatic display and go all out. Image: The Fox and She. A great place to store all that party decor you wanted to keep just in case. Image: Blondie in the City. 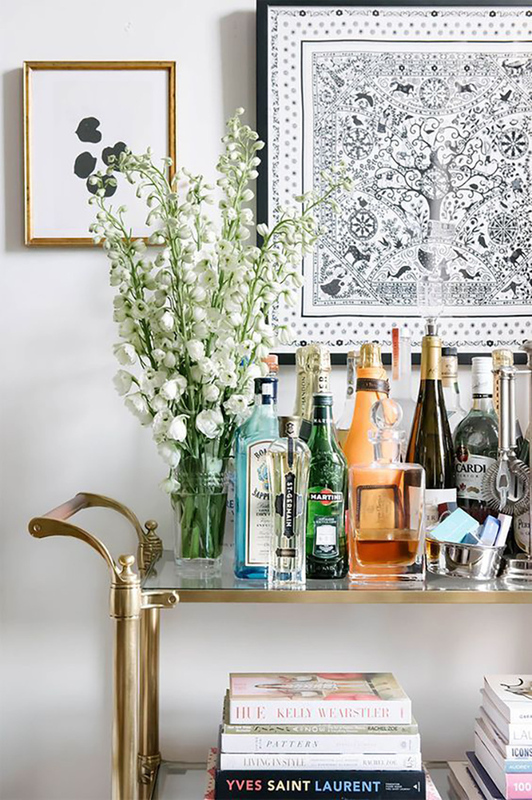 Proof bar carts don't have to be meticulously organized to look great. 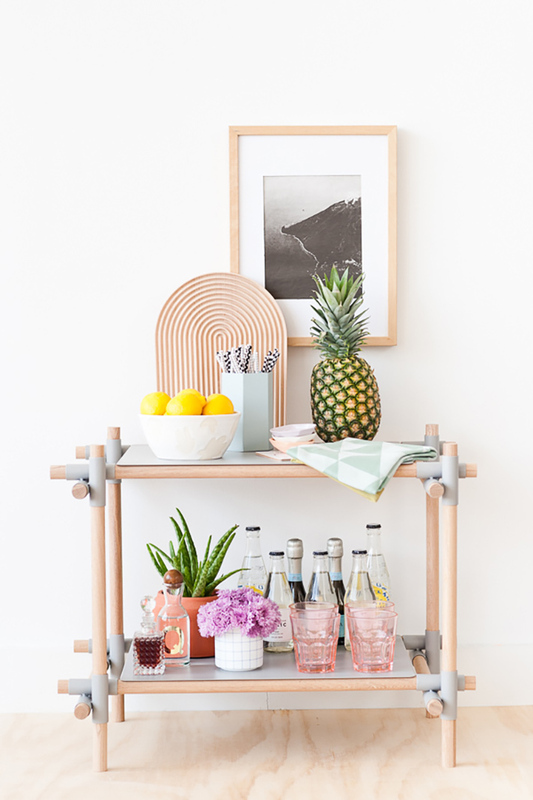 Flowers, plants, fruits, straws, art — this display has it all. If you own a letter board, now's the time to whip it out. 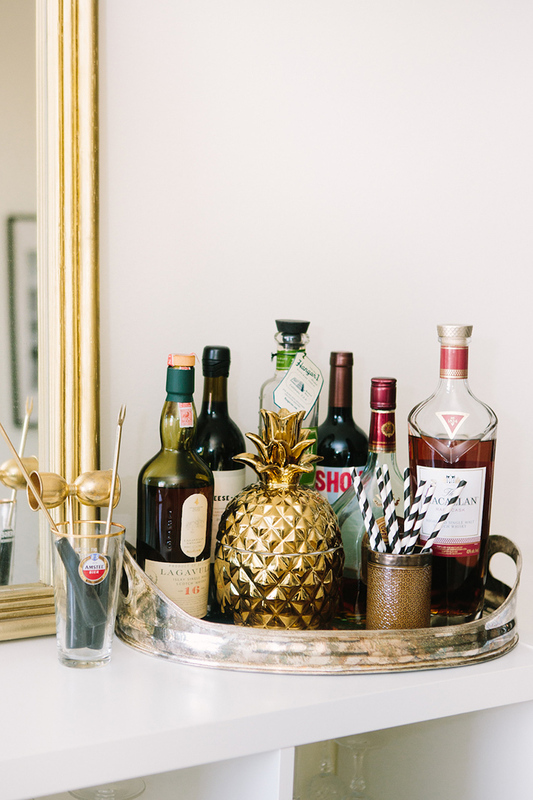 Make your spread feel distinctly beachy with pineapples and pictures of paradise. 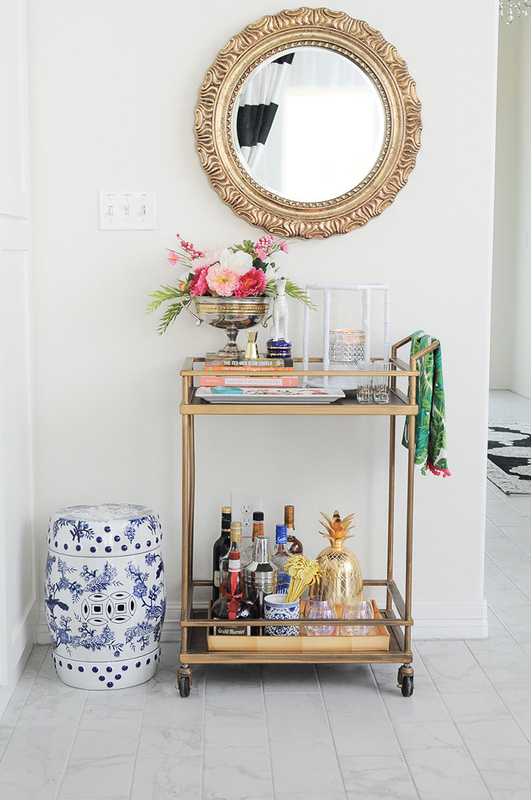 Getting a tiered cart, like this one, will offer easy access to both shelves. 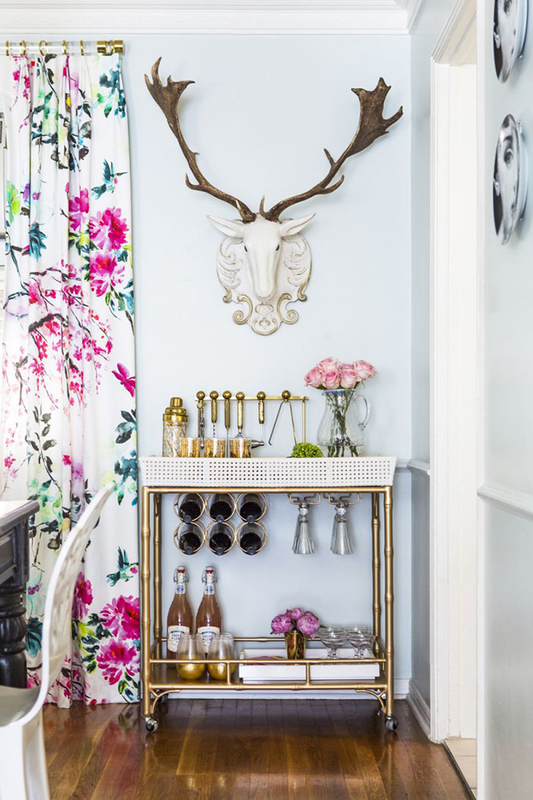 Plus, you won't have to worry about making sure your decor looks vertically balanced. 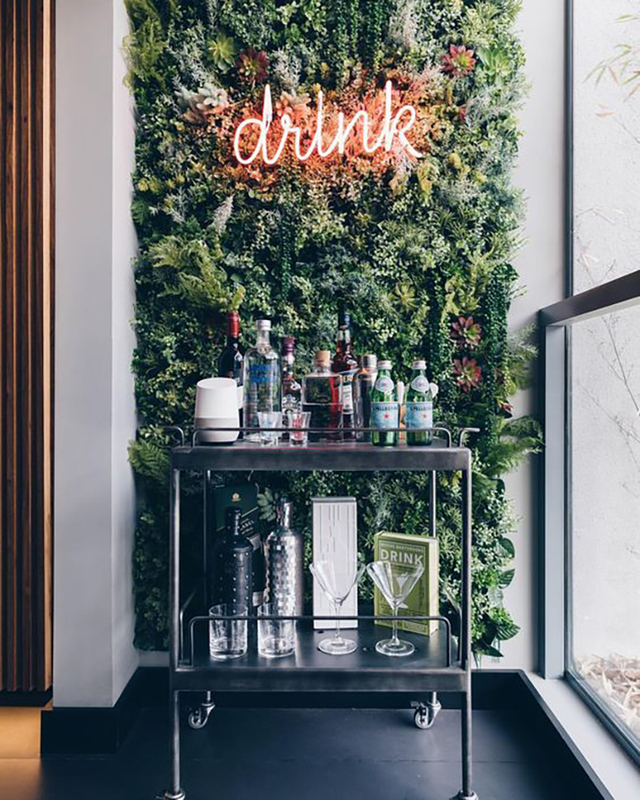 Neon signs: Always a plus. 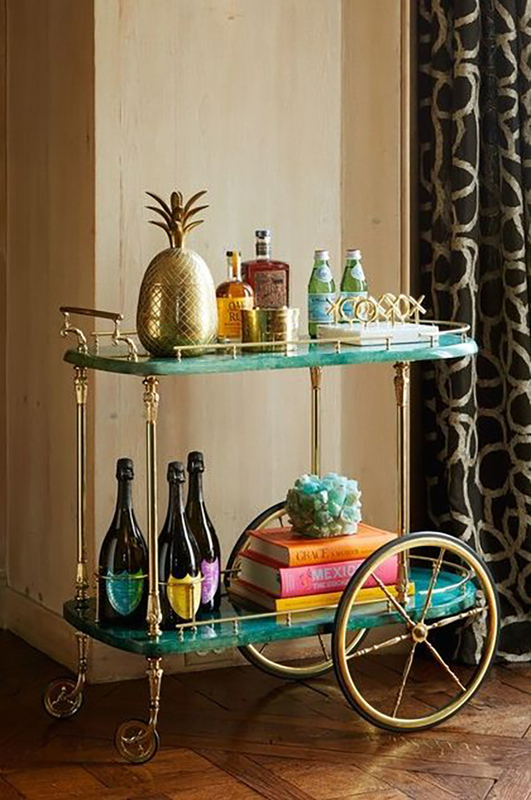 In case you still weren't convinced books look great on (and behind) bar carts. 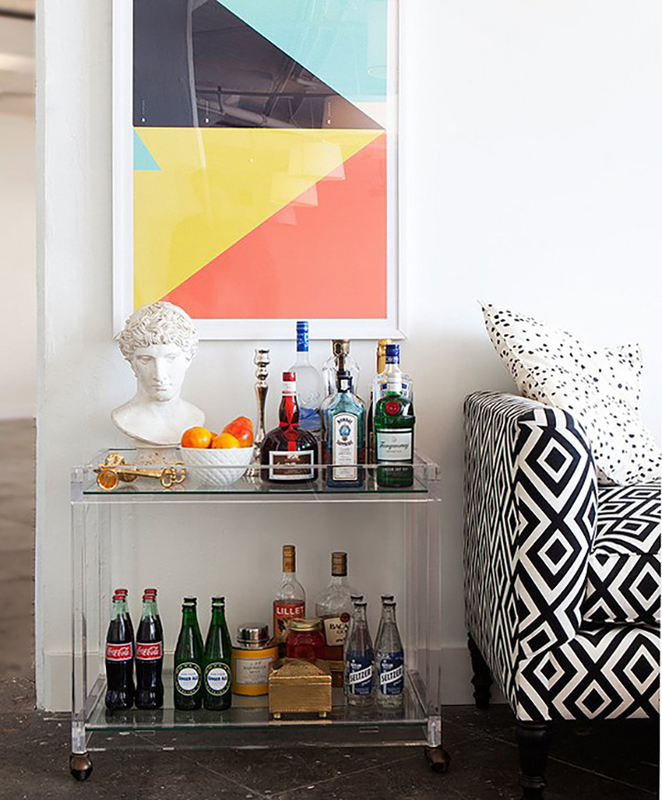 Shorter glassware is the perfect thing to slide into über-short shelves. A pitcher you can mix cocktails in is a very nice touch. Not super-into the glitter sign, but the upside-down glasses are incredibly cool. Figuring out how to organize disparate elements can be tough. 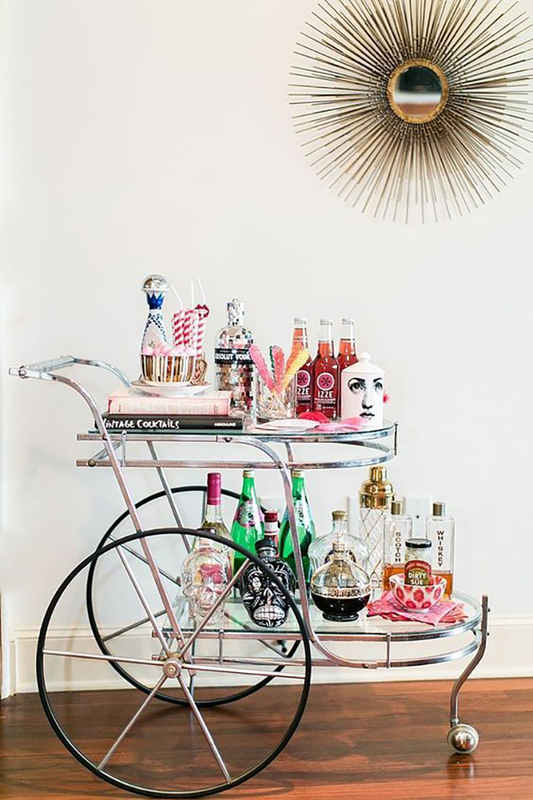 The genius behind this bar cart completely nailed it.